My reference for much of this history is from Lord E of the United Neighborhoods alliance in case there is any disagreement. 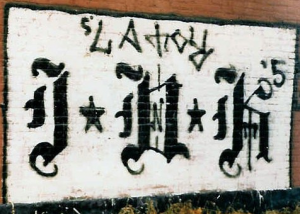 The intersection of Leavitt and Schiller in the Wicker Park community used to be the capital for the north side Latin Kings and was ran directly by their founder. In 1971, the top Latin King crows left Leavitt and Schiller and only pee wee members stayed at that intersection, some of these Pee wees would go on to found the Insane Unknowns. In the fall of 1973, the pee wee Latin Kings from Leavitt and Schiller that attended Roberto Clemente High School (1147 N Western Ave, Chicago, IL 60622) in Wicker Park were kicked out of the Latin Kings for violating the rules of the gang. The leader among the youths kicked out named T.J. was not happy with being exiled and instead formed his own group with the others and called themselves “Undercover Kings.” TJ started off this new group with a gym bag filled with guns, they were ready for action. TJ was also a white guy, even though the Unknowns would eventually become a predominately Hispanic gang they were founded by a white guy. By 1974, took over Leavitt and Schiller and flipped the rest of the pee wee Latin Kings into the Unknowns right outside of Sabin Elementary school at 2216 W Hirsch St. When the Undercover Kings started to claim Leavitt and Schiller as their own they developed a solid name and became known as the “Unknowns” and adopted the color black and wore solid black sweaters with no bars on them, it was about 1974 by this time and the Unknowns united with the Spanish Lords of Bucktown and the Warlords of Wicker Park and were accepted into the United Neighborhoods alliance now that the Unknowns were a legit organization with territory. Together the United Neighborhoods went against UFO allied gangs like PVR/PRP, Taylor Jousters, Gaylords and Chi-West but refrained from the most part with warring with Hispanic gangs as this was the ways of the alliance, but by 1975 that would change for the Unknowns. In 1975, TJ wanted to add onto the name and came up with the “Insane Unknown” name and added the color white to their colors. In that same exact year King Cobra of the Spanish Cobras invented the “Insane” in their name and when he got word that the IUKs were using that Insane moniker, he confronted TJ and told him to drop the Insane from their name. King Cobra claimed they came up with Insane first. TJ down right refused to submit to the Cobras and said he will not change it and was more than willing to go to war with the Cobras over it and so the war began. The Spanish Cobra and Insane Unknown war became instantly furious as the IUKs took the war to the extreme. In one incident on a Saturday night, the Insane Unknowns tied a rope around a section of a 20-foot-long wooden picket fence that had Cobra graffiti on it. They uprooted the fence section and dragged it all the way down to Leavitt and Schiller and defaced it. After tagging over the fence post they dragged it back to the spot where they got it and reinstalled it upside down to further disrespect the piece by throwing it down. This an example of the great lengths this organization would go through to hurt their enemies and many more actions would come over time. One of the craziest early members of the IUKs was “Tank.” Tank would ride around on a bicycle armed with two guns up and down Leavitt and would chase rival Vice Lords around threatening them. 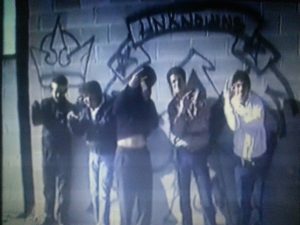 In 1976, it looked like the Unknowns were well on the way to becoming a future Folk Nation gang due to being allies with Royals, Almighty Popes (Insane Popes), PBCs (Paulina Barry Community) and Black Gangster Disciples while they were at war with Latin Kings, Gaylords and Insane Deuces. The IUKs used to hang out with Latin Disciples in the Von Humboldt School Yard located at 2620 W Hirsch St, Chicago, IL 60622 at Hirsch and Rockwell In the East Humboldt Park neighborhood. Also, in 1976 the Unknowns spread their influence into the West Humboldt Park neighborhood opening territory in the K-Town section at Grand Ave to Cortez and Kostner to Pulaski Road and Iowa and Springfield. They also opened at Cortez and Kostner and Hirsh and Karlove. At Hirsh and Karlove they were right outside of Alfred Noble Elementary School at 4127 W Hirsch St, which would serve as great recruiting opportunity. Another new opportunity for expansion would come when the Unknowns landed in the Lincoln Park neighborhood at Orchard and Drummond right at the playground at Alcott Elementary School at 2625 N Orchard St. Another major section to open was over in the Bucktown section of the Logan Square neighborhood at Damen and Dickens (Hooterville) in 1976. This area was headed up by Mr. Capone who was also the leader of the pee wee members of the IUKs. By 1976, the Unknowns opened a section at Ashland and Wrightwood in Wrightwood Park at 2534 N. Greenview Ave in Lincoln Park which spawned from the Orchard and Drummond section. 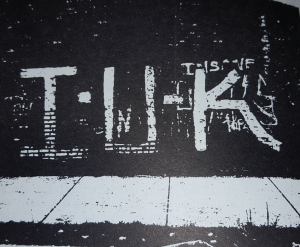 Ashland and Wrightwood brought in some more white members into the Insane Unknowns also the first black members because members lived in the nearby Lathrop Projects which had a lot of black residents. When the Unknowns landed at Ashland and Wrightwood they were in close proximity to the Simon City Royals at Fullerton and Southport. Back in 1976, the Simon City Royals were functioning with no leader, which meant each individual section had their own leader. Even though Unknowns and Royals were getting along in most sections the leadership of the S/P Royals did not want Unknowns moving into that area; therefore, they ordered one of their newer members “Deadeye” that had flipped from being a Gaylord to being aRoyal, to invite Mr. Capone to hang out and party then kill him. “Deadeye” was good pals with Mr. Capone and the Royals feared he was going to flip again and become an Unknown, so in order to ease Royals’ fears the Royals said “Deadeye” needed to prove himself or die by killing Mr. Capone. Deadeye orchestrated the murder by posting Royals on rooftops as they waited for Mr. Capone to show up in the neighborhood. Mr. Capone was supposed to wait for Spanish Lord and Warlord allies to join him for the meet up, but he didn’t bother to wait for this backup and instead he was struck down in a hail of gunfire from the rooftops. The Unknowns wasted no time getting revenge when they killed a high-ranking Royal named “Bulldog” in retaliation. The war became harsh and bloody between these former allies, and since the Popes, PBCs and Black Gangster Disciples were pals with the Royals the Unknowns were battling it out with all these gangs as well. The Insane Unknowns were also in pretty close proximity to the Latin Eagles that operated in the nearby Lakeview neighborhood so bloody war would soon explode between these two gangs as well. In 1976, the IUKs went to war with the Latin Disciples after the Disciples joined the YLO alliance alongside the Spanish Cobras that were already sworn enemies of the IUK. 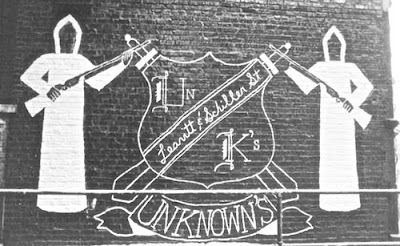 One after another the IUKs were going to war with clubs that would eventually become Folks later. 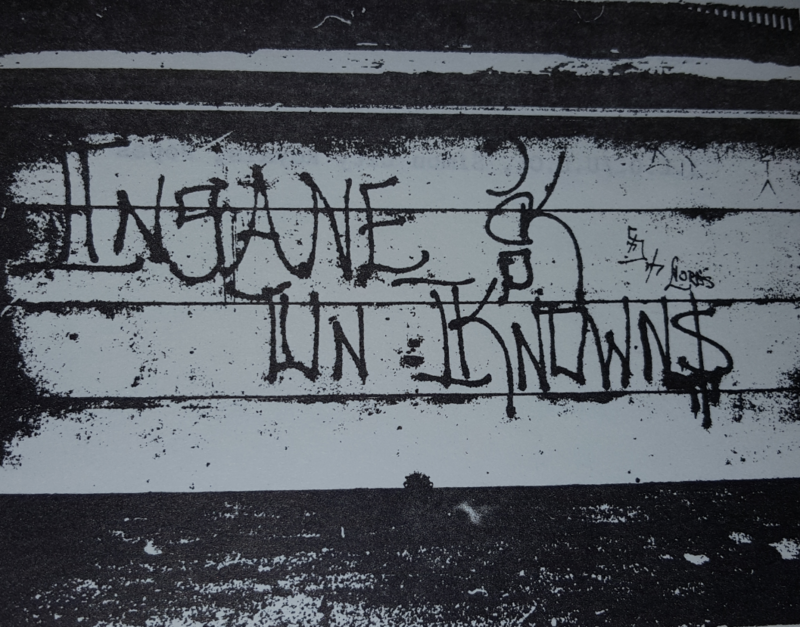 By 1978, the Insane Unknowns became well known for being the killers of the leaders of rival gangs. Basically, they were known for cutting the head off the snake, and viciously killed many rivals. In 1978 the Insane Unknowns hurt the United Latino Organization (ULO) alliance by killing top leaders. In 1978 a 15-year-old member of the Insane Unknowns named Miguel Vargas gunned down Ramon “Prince Chi Chi” Vasquez who was the leader of the Latin Disciples (MLDs). Vargas was convicted of the murder but only tried as a juvenile. The Latin Disciples would not get revenge on him until 1983 when Fernando “Prince Ferny” Zayas killed him in Andersonville on his front porch. In April, 1978 the Folk and People nation alliances were drawn up in the Statesville Prison that allied the biggest and/or oldest street gangs in the city. When the People nation was formed the Insane Unknowns were easily invited into the People Nation alliance because they were a part of the United Neighborhoods alliance but more importantly they were real close with Flaco and the Spanish Lords in Bucktown. After this alliance was drawn up the IUK war with Latin Kings came to an end especially in 1979 when the Latin Kings became a part of the United Neighborhoods. After these alliances were drawn up the Unknowns had to slow down their conquests at opening new sections because they wanted to maintain their alliance with Latin Kings, but in the 1980s the Unknowns began opening territory in the Chicago suburbs in Waukegan, Berwyn, Elgin and Rockford just to name some. In 1978, Latin Kings began to move back onto Leavitt and Schiller. 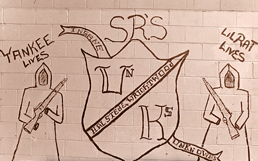 Now that both gangs were allies the IUKs decided to share the territory with Latin Kings. Another major blow to the ULO was on April 14, 1979 when the Insane Unknowns killed the leader of the Spanish Cobras Richard “King Cobra” Medina right outside his home. A major war ensued as the Cobras and Unknowns kept killing each other night after night. The string of murders caught attention of the news as everything about the Insane Unknowns and Spanish Cobras were in the newspaper. The front page of the Tribune in 1979 even published a photo of two detectives posed on the rooftop at Leavitt and Schiller next to very impressive gang murals that the Unknown had done. They even invited their allies the Future Spanish Lords to do some tagging at that spot. There were several brutal killings during the 1979-1981 wars with the Cobras. Tank became a well-known member to the police and his profile even traveled up to Mayor Jane Byrne’s office after he killed someone with a sawed off shotgun. Mayor Byrne paid for a one-way ticket for Tank to fly down to Puerto Rico and never come back. Tank would later pass away in Puerto Rico. Tank’s brother was shot dead by the Spanish Cobras as he went to visit his grandmother that lived in Spanish Cobra neighborhood in the winter of 1979. The Cobras had warned him on a previous day to not be seen in the area but Tank’s brother wouldn’t let that get in the way of seeing his family so he went anyway, the Cobras then chased him while shooting him until he ended up under a car and they continued to shoot him until he yelled out, “Stop already you killed me!” They shot him 18 times. This was one of the violent actions that prompted the IUKs to kill King Cobra a few months later. The Insane Unknowns kept hitting the Cobras back and that is what kept the war going. The IUKs developed a policy to not let things go and to always retaliate brutally and they showed the world this in 1979 when they shot it out with the Cobras. The IUKs would use brutal and inventive execution techniques to put that point across. One example was when members put bags over their heads and shot four youths dead at 3848 West Hirsch (between Avers and Hirsch and Springfield and Hirsch). In one other incident the Cobras went to Leavitt and Schiller and approached an IUK and asked him if he was a IUK. The IUK knew they were Spanish Cobras and proudly said yes, he was and flashing the IUK sign at them, the Cobras then shot him with a .45 pistol. The IUK then staggered behind the backdoor of Jr’s Burgers and waited in hiding for the shooter to appear again then when he spotted him he shot the Cobra shooter several times getting his revenge. Some time later he was gunned down by Cobras at the same intersection and the same ER nurse treated him, this time she became upset with the repeat visit and quit her job. 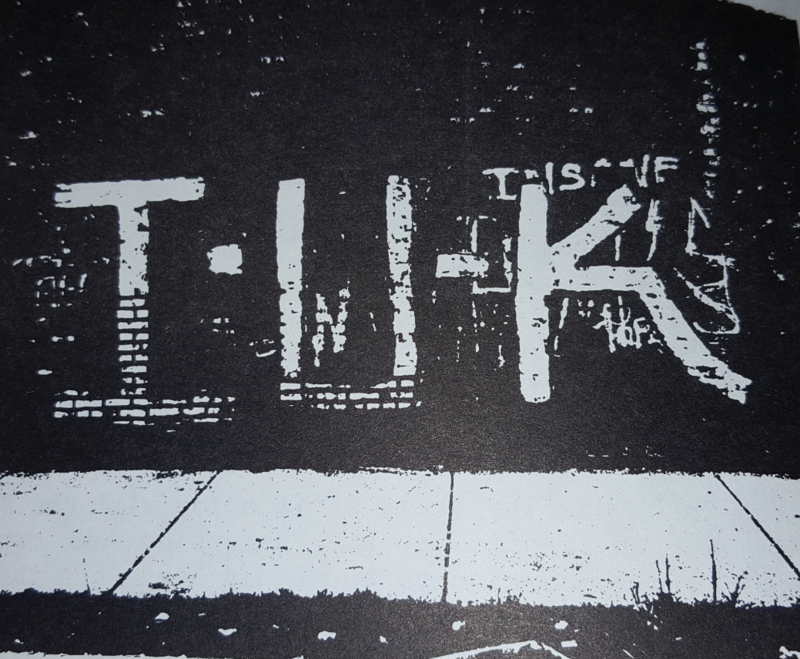 Photo from a 1980s Chicago Police manual. There is recognition for the Spanish Lords in the tag back with the two were close. The famous Leavitt and Schiller wall mural Wicker Park 1970s, this corner was big for the Unknowns to take and maintain. This is from a 1985 documentary about Chicago gangs. 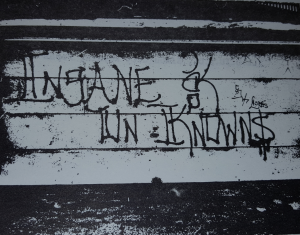 In 1982, the Insane Unknowns became a part of an alliance created by the Warlord’s leader Lord E called the UPK (Unknowns, Players and Kings). This was an alliance established by the top leadership of the Insane Unknowns, Warlords, M.A. Players and Latin Kings to protect all interests in the West Humboldt Park section. Being a part of the UPK and the People nation helped to greatly solidify IUK presence in West Humboldt Park and helped the organization grow new areas and the suburbs such as Waukegan and Rockford. In 1992, the Latin Kings and Insane Unknowns broke out into a war over drug territory. The Latin Kings were of course trying to be the bigger brother and take over some of Insane Unknowns’ drug operations and that set off the Unknowns. The Spanish Lords were stuck in the middle; however, they ended up siding with the Latin Kings and now Unknowns were fighting wars with both gangs by 1994. The war only lasted about two years then the alliances were restored back to normal. For the most part Insane Unknowns, Latin Kings, Spanish Lords and Latin Brothers were very close allies in the 1990s but eventually their alliance with Spanish Lords and Latin Pachucos would crumble. Over time the Insane Unknowns really did not lose any territory to rival gangs and engaged in all wars effectively due to their quick use of extreme violence to keep rivals out of their turf. The ones that would end up taking over all of Lincoln Park, Wicker Park and Bucktown territory were the yuppies and hipsters. After the 1990s, these neighborhood homes began to get rehabbed and sold for top dollar which would attract upper class yuppies and hipsters to buy out the properties or landlords that would only rent to bigger income types. Gentrification is a force that cannot be stopped, and it does not matter how tough of a gang you have, money talks, and that is what brought about the demise of the fearless Ashland and Wrightwood and Damen and Dickens sections. If it was not for gentrification, those sections would still be poppin more than likely. West Humboldt Park has never been gentrified; therefore, the Insane Unknowns have not lost any territory there over the years except their first section of Iowa and Springfield. Please send in old school pics from the 1970s, 1980s and 1990s! What happened to Iowa and Springfield? What year did it fall? What year did Leavitt and Schiller and Hooterville close? What caused the war with Latin Kings and with Spanish Lords?